Recently I’ve been lucky enough to participate in a 8-day yin yoga, Buddhism and mindfulness retreat with the amazing Sarah Powers and her wonderful husband Ty Powers. The location in itself was magical, in the middle of the Dordogne in France, next to a river, far from civilisation: Moulin de Chaves. I stayed in the dorm and besides it being quite humid (we later asked for a dehumidifier that helped a lot), it was simply perfect. The roommates in the dorm were nice and respectful of each others privacy and despite the rain (lots of it during the retreat), it was a wonderful experience. Every day we enjoyed amazing food which greatly helped our practice: fresh, organic, local, vegetarian, vegan, … Made for us with much love by the staff of the Moulin, often there was a dessert as well, but I stuck to being sugar-free for this retreat, except for the last day when there was a vegan apple crumble 🙂 We were really motivated by our teachers to dive deep inside ourselves, to do self inquiry (both during Yin Yoga classes and meditation) and face our fears and other hindrances that take us away from mindfulness and peace of mind in our daily lives. The yin yoga classes were very instructive and went further than I had imagined, as we were presented with some anatomy, lots of information about the different meridians and the impacts of excess or disturbed energy in the meridians and the impacts on the organs and emotions. We did quite some sharing with the fellow students and at times this was quite emotional for some of us. From Friday evening until Sunday noon we were asked to remain completely silent, if possible also by not smiling or looking to each other (Vipassana method) to allow ourselves to go quiet and make the self inquiry even easier. I admit that I looked forward not having to talk for some time and to be quiet, but it was a lot harder than expected. My mind tends to get restless and if there’s no book, internet or discussions to distract oneself, it’s quite a challenge. Obviously this was the objective, to observe how our mind functions and to control the mind to be more relaxed and in balance all of the time. We received a lot of mental support from the teachers and in all, it was a very interesting and satisfying experience, albeit not an easy one. I believe that many people were happy when it was Sunday lunchtime and we could again socialize. After this silent period, there was an overall sense of being part of a group and people were very happy to share their experiences and friendships were forged. Many of the attendees are long-time yoga practitioners, have their own studios around the world or plans to start one. It was a wonderful experience to once again be part of a big yoga family where everyone has at least one very important shared value: the love for yoga, sharing the teachings and its benefits. 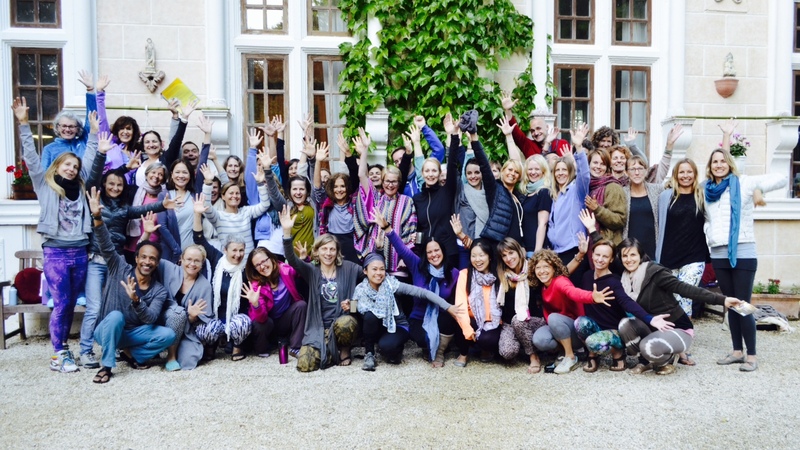 This retreat has brought me much more than I could have imagined, a renewed interest and motivation in meditation, lots of inspiration from Buddhist teachings, great insights in the human body and especially the energetic body (meridians) and more than ever the intention to practice yin yoga regularly and to start teaching it in the near future as well. Moreover, meeting such wonderful yogins from around the world has strengthened my hope for this world as I’m sure that everyone of the attendees (and other yogins around the world) will pay forward the teachings of love, kindness and compassion that we learn in yoga. I won’t say a lot more about the teachers, because you have to simply experience them, their energy is so beautiful, it simply has to be experienced. They truly live, breathe and are Insight Yoga. Check out their website for events near you and remember to register in advance as their events fill up very quickly. Categories: Meditation, Spiritual, Workshop, Yin yoga, Yoga classes | Tags: France, Insight, retreat, Sarah Powers | Permalink. This is a very simple, yummy and filling recipe for a delicious brunch with scrambled tofu instead of scrambled eggs. Press the excess water out of the tofu (by pressing the tofu above the sink with both hands or by putting it between 2 plates and adding weight – like a heavy cookbook – on the top plate). Crumble the tofu using a fork or other kitchen utensil. Add turmeric, the soya sauce of your choice, a pinch of Cayenne pepper and sprinkle with the nutritional yeast and black pepper. Mix everything until the all the spices and seasoning are well blended together. Leave the mixture for about 20 minutes to allow the tofu to soak up the flavours. Heat up the (coconut) oil in a skillet and fry up the crumbled tofu until it turns a bit brown (or however you like it). Serve on sourdough bread with your choice of pesto or veganaise (ideas: kale, parsley) and with stir-fried mushrooms and/ or cherry tomatoes. 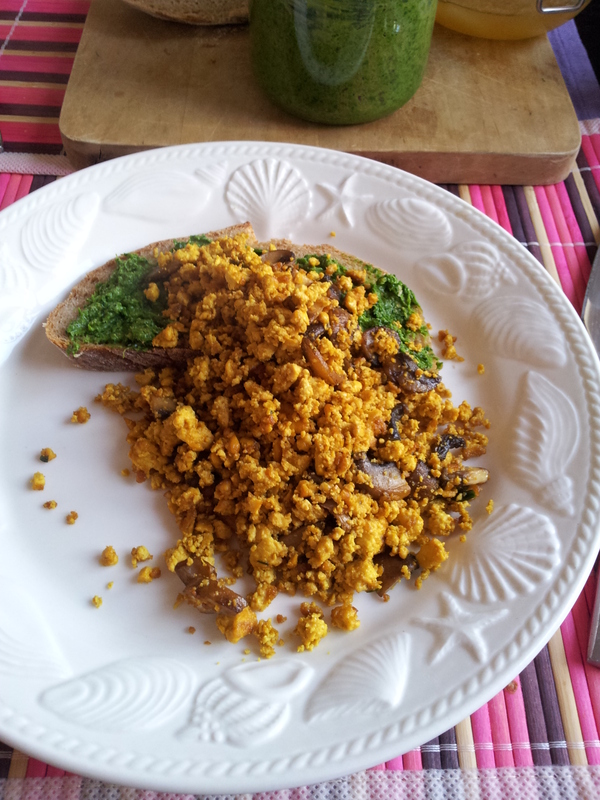 Tip: the nutritional yeast gives the scrambled tofu a nice nutty flavour. You can vary the amount of spices and soya sauce according to your own preference, just experiment until you are happy with the tastes. Categories: Yogi food | Tags: nutritional yeast, recipe, tofu, turmeric, vegan | Permalink.